My family and I had the opportunity to go to Washington D.C. on our last move across the country. You could spend a lot of time in D.C. and still have things to look at. 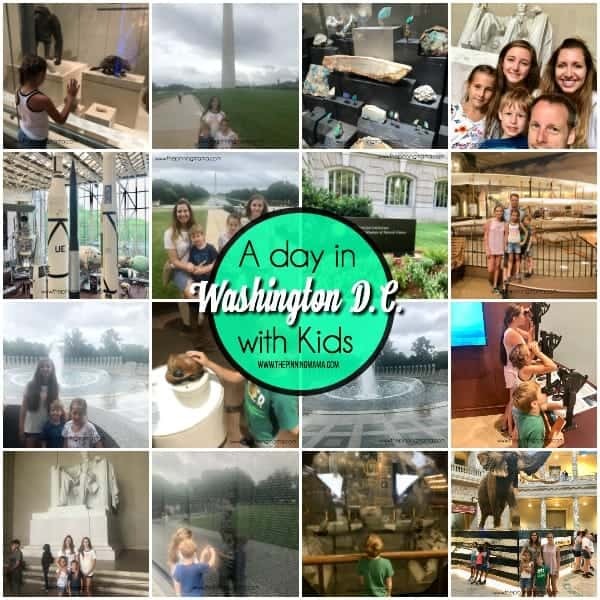 I will give you a quick run down of our favorite places to see when visiting D.C. Also the best part about traveling to D.C. with your kids is all the museums are FREE. The thing I love about D.C is my kids never get bored when were there. Every where you look there is something to see. The city is so clean and friendly. The museum features animals from all over the world, ancient gems/stones, dinosaurs, and all ancient forms of life. There is so much more in the museum but that gives you a little insight. My kids absolutely loved this place and there was so much to see, we couldn’t get to it all in just a couple of hours. Whatever your child is in to he/she will find it here. It captures the curiosity of many. One of my kids favorite parts of the museum was the gems and stones form all over the world. They loved finding their birthstones and looking at beautiful jewelry worn by famous people. They also loved riding their favorite animals ( all are stuffed but real) and getting up close to look at their detail. I know we could visit this place over and over and never get bored. They also have a cafeteria inside if you find yourself needing a meal. 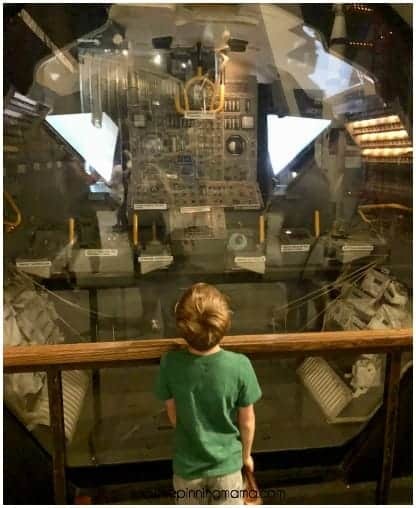 My little guy was over the moon excited to visit this museum. He had waited all day to go. Once you walk in you are surrounded by airplanes, jets and everything space. The Air and Space museum has her thousands of objects on display. A few things you can see are The Wright Flyer, a lunar rock you can touch, numerous military planes, and a lunar module that once landed on the moon. Along with objects on display you can also discover how things fly, look at engines, instruments and uniforms. You can learn more about space in the space exhibits….. and watch a show at the planetarium. You can also take flight in their virtual reality simulator as well. The National Archives holds a lot of America’s important documents inside. This is probably not the most exciting place for kids but I feel like this place is for the parents. Some of the important documents you will see here are an original copy of the Declaration of Independence, the Constitution, and the Bill of Rights. 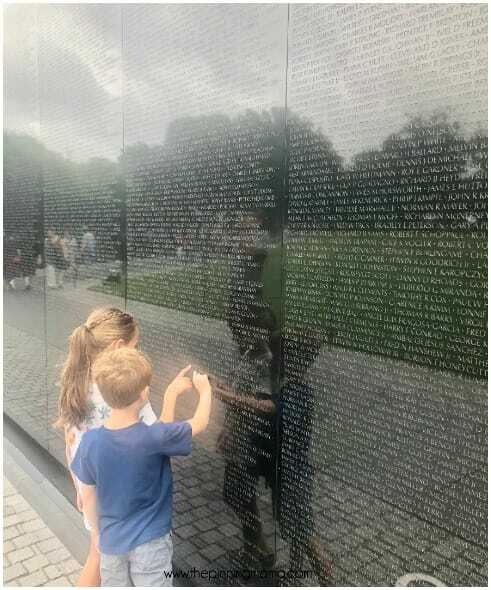 This memorial honors the men and women that served in the Vietnam War. More than 58,000 Americans lost their lives during this war. This is a beautiful memorial located within walking distance from the Washington Monument. Directly across from the Washington Monument and the Reflecting Pool you will find the Lincoln Memorial. The memorial is made of stone from different regions in the United States. Inside this memorial you will find carved inscriptions form Lincoln’s inaugural speech, along with his Gettysburg address. You will also find a very large statue of Lincoln sitting in contemplation. This memorial honors the 16 million service Men and Women in the Armed Forces. A wall full of over 4,000 gold stars reminds us all of the sacrifice over 400,000 Americans paid for our victory. This is beautiful memorial with water features. A moving place to visit and teach your kids a little about their history. We were not able to go inside the monument, they are closed for renovation until Spring 2019. The monument is very impressive from the outside and hopefully we can go back to see the inside in a few years. This tower was build to honor President George Washington and it stands at a large 555 feet in the air. Made of marble this monument is sure to catch your attention at every angle in D.C. If you can visit all of these in 2 days or less you are doing good. We had only 2 days in D.C. and we managed to see all of those. Our kids keep asking to go back. Just be prepared with walking shoes because you do a lot of walking while you’re there. I would also bring an umbrella because afternoon thunderstorms are a regular in the summertime. I hope you all enjoy D.C. as much as we did. If you have any more tips and trick or places to visit in D.C. please comment below.